First drive Holden Commodore ZB: How good the Aussie Euro? Opportunity to drive the latest Commodore on New Zealand roads has finally arrived. 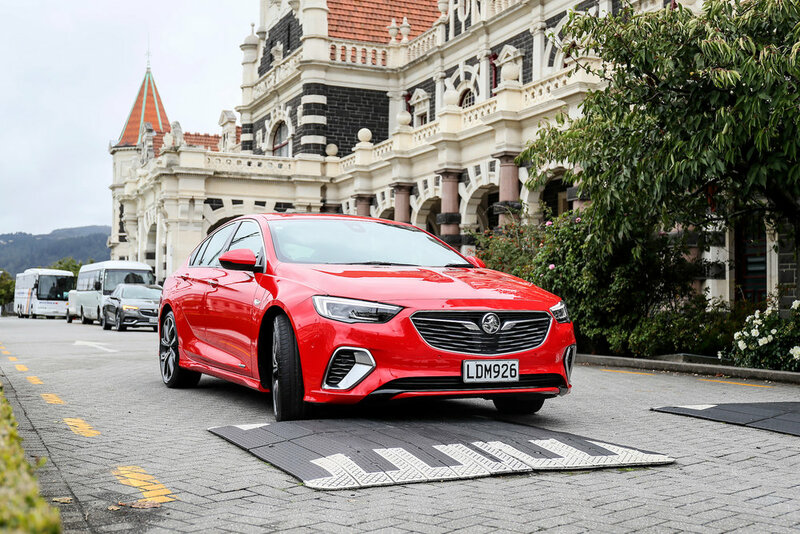 AS lead development engineer for the ZB Commodore, David Johnson spent considerable time working alongside Opel engineers in their home territory. As result, he’s become a dab hand on the Nurburgring and has likely achieved heightened proficiency in colloquial German. There’s every chance some of those colleagues are going to hear some extremely earthy homeland venacular from the Melburnian very soon, assuming they haven’t already. Across to the big-spend national media launch event to spread the gospel about why a car that is so key to Holden’s standing, the brand’s special emissary was annoyed and embarrassed about the state of some of the cars presented for our evaluation. The ZBs we were driving were already a little different to those which will hit the showroom in April. Ours were what known in-house as MVP stock – this is, vehicles built to a saleable standard but for public access. That wasn’t the issue. What miffed, he conceded in a pre-drive briefing, was that four of the 12, entry and mid-level models with the 191kW/350Nm 2.0-litre turbopetrol that is expected to be the big hit item, had not been built by Opel to Holden’s directive, having been provided incorrect suspension tuning. The dampers Holden hand-selected for the car and sent to Opel for fitment failed to transfer to these evaluation units. Instead, they had the type preferred by Opel. Unfortunately, an error perpetrated on the Russelsheim assembly line last July was not identified until well after they reached New Zealand in November. There was no time to do anything about it. Which meant? No difference in dynamic ability, we were assured. It was all to do with ride compliance; Opel’s setting being firmer than the Holden choice. How much firmer? Well, ‘discernibly’ firmer. We’d know if we drove them back to back. A comparison that could not be made. Unlike at the Australian media event two weeks prior, there were no 2.0-litres here with the correct settings to provide a barometer. The show had to go on, but Johnson was not pleased. He planned to be talking to damper developer, Tenneco, and to Opel. “I’m not that happy about it, to be honest,” he told me. “The Opel tuning is not terrible … it’s what they have in Europe and the Europeans are happy with it. But I just think our locally-developed one is better.” That tuning, by the way, was signed off last March. So there was that. Then, next day, another hot issue. It arose during the launch drive, an indirect run from Dunedin to Queenstown in which we regularly stopped to swap between derivatives. For me, that meant a good span of exposure: Starting with a front-drive base car, the LT in sportwagon form, then going to the same bodyshape in its price leader V6 all-wheel-drive format, the RSV. From there back to the top of four-cylinder liftback foodchain, with an RS edition, then through two examples of the flagship VXR sports five-door, before settling back into the wagon line, with the crossover-formatted Tourer and then back to another LT loadall for the last stage. That RSV wagon we had for the leg two felt like a hot choice on the road … in fact, I recall idly remarking to my driver partner that it smelled that way too. As we loaded our bags into the boot, I recall remarking about what I thought was a vaguely oily aroma. I was sort of right. What I’d caught was the whiff of melting plastic: It was all the more pronounced later than morning, during our stop at Oceana Mining’s vast McRaes pit. The car came in with the bottom part of the shroud around the dual exhausts distorted and dripping. Why the exhausts were creating such huge heat perplexed Johnson until he stuck his head under the back of the car. This time, some choice Aussie words were heard. Anyway, these were hiccups that normally don’t happen on launches. Fair dues to Holden New Zealand, though. Everything else about the drive day was brilliant. Great driving roads through a great part of the country, in a generally great car. And, yeah, it truly is. You’re now going to ask if it’s also a great Commodore. And I’m going to say …? Well, two points. First, it’s a bit unfair to use this car to bag the outgoing VF. Not simply because they are so different, but because it also demeans what, to my mind, was the best all-Aussie Commodore ever, especially in the SS-V Redline format that has not been emulated. Second, despite some dimensional and special commonality, the ZB is not the same kind of car anyway. It quite probably won’t restrict to the same audience that VF and its forebears attracted. And by that, I only mean the six-cylinder audience. On the strength of having had around six hours’ exposure spread across six editions, I’m all the more certain V8 types will struggle to find anything approaching an equal in the new line. But it’s different. A lot different. In taking a front-and four-wheel-drive car based on a European design and built in Germany in place of a larger, heavier rear-drive machine from across the Tasman, we’re not starting a new chapter. ZB is far more a whole new book, in a whole new language; characters only seem familiar to a point and that the names are familiar is of minor consequence. The storyline is new. Quite possibly, the outcome of this tale might also change. Holden’s belief that the customer base is set to shift, too, with more new ‘readers’ than old, seems sound. The majority of these new models are aimed squarely at cars not really in the old Commodore’s crosshairs; from the Mazda6 through to the Skoda Superb in pure road form, to several soft-roaders in respect to the Calais Tourer. About that last one. Even though this was the version in which I had the least amount of wheeltime in, barely 20 minutes from Ophir (I’d highly recommend the blue cod spring rolls at Pitches Store restaurant) to a carpark overlooking Clyde Dam, the second crossover Commodore ever made the biggest positive impression. Having a higher-riding, crossover-looking wagon in the family seems to me to be a masterstroke; SUVs are hot items and this car seems entirely the right stuff in look, fit-out and driving ambience. Only the Calais namebadge should have been kept in the bottom drawer (grotty French port, visual association with red-faced old blokes at the races). That it delivered the best vibe for me was probably inevitable, given that I own the very car Holden is out to match, at least for road-restricted use (because the Tourer simply does not seem set up for off-road driving), the current Subaru Outback. Which raises a point, already, about why Tourer is just a one instead of several. I would agree that product planning is a thankless task, all the moreso when being asked to crystal ball years ahead, as Holden was with the ZB. The lineup we have now was being sorted in 2012. The V6 Tourer made sense then. Not sure it entirely does now. I’m not advocating that this car should also be diesel. It would be nice, but to make that concept work they would need the higher output biturbo diesel that restricts to the Opel and Vauxhall equivalents of this Holden, but has been ruled out by Australia due to cost. Yet it is begging for that 2.0-litre petrol, whose fitment is entirely possible (Vauxhall and Opel have Tourers with it). While the V6 is perfectly decent in its responses and refinement, yet while it feels strong, it needs to be revved to really deliver the 235kW/381Nm goods. It also only evidences strong aural character in the VXR (and even though, some of what you hear is artificial) and does seem to have a propensity to be a drinker in ‘real world’ operation. None of the six-cylinder cars I drove in came remotely close to equalling the 9.1 litres per 100km optimum claimed by Holden. Averages accumulated on our day ranged from 11-12.7 litres per 100km; no better than what you’d get from the outgoing SV6. Yes, some in our group were driving hard, but who’s to say actual owners won’t also? History compelled Holden to keep a six, yet this level of burn from a naturally-aspirated mill shared, according to Johnson, with a Cadillac car and a bunch of GM trucks could well be the bugbear. So I think a medium spec edition with that boosted four-cylinder petrol would be an even better fit for Kiwis. Holden here must surely have noted not only that 2017 was the biggest year ever for Outback but also that nine out of 10 were 2.5-litre editions, not the 3.6. Johnson, for his part, listened politely to this pitch then asserted that Holden presently has no plans to follow this path. The variants that do have the four-pot are well-served. In terms of its low-speed thrust and mid-range stomp, it actually has more immediacy than the flagship engine. It’s also just as smooth and mostly as refined, save when given a huge bootful. Then the exhaust is very whooshy; a bit as if you were dragging a section of carpet under the car. But I like what it does. Also agreeable is the nine-speed automatic. The gears are very closely stacked – so much so that second third, on hand shift, makes negligible difference in rev count – but is well better than, say, any CVT. It’s sharp and smart enough to offer a ratio for almost every occasion when left to its own devices, but also does well when hand-shifted (so, a pity, that the cheaper derivatives lack paddles). It also allows for exceptionally long legs, the tachometer sitting fractionally under 1400rpm at 100kmh in top gear. I’m not saying this Commodore should not have been served without a V6, but would suggest that one without the big engine is by no means small-hearted. There is genuine verve here, too. Enough to warrant why the biggest fleet customer, the NZ Police, are reputedly set to progressively swap thei VF sixes for ZB fours. It really is a very good powertrain. Doubtless, so is the diesel, not least because while serving the least power (125kW) it has the most torque (400Nm). Yet t’s absence from drive day (blamed on logistics) simply reinforces my view that it is not likely to be here for long. Demand for diesel road cars is modest and declining by the day. Those few who want it should get in quick. There’s more to the story than stonk. The main input from Johnson’s crew has been to the steering and suspension tune, and even though the four-cylinder cars were only halfway there, the V6s were to fully Holdenised presentation, and those at highest level have what’s called the HyPer Strut (which aims to give an effective pivot-point on the lower control arm that minimises camber and caster-angle changes as the suspension moves through its arc), basically the Aussie’s assertion that we’d be able to pick the difference in how they rode would be evident. He’s right; the fully-fledged Commodores, even when on the largest and lowest-profile tyres- the base-models have 45-series 18-inch tyres, the rest 19s or 20s in 35-series profile - and, in VXR trim, with adaptive dampers, were more compliant than those retaining Insignia tuning. With less road noise, too, on occasion, though all cars I drove were relatively loud over coarser chip. The big selling point, whose denial from the four-pots is also frustrating, is four-wheel-drive. The front-drive cars we experienced had decent balance, no argument, though how much of that was Opel, and how much Holden, is something I cannot answer. In any rate, on a winding road the AWD advantage is plain to see; those cars still scamper when the lesser editions scrabble. The traction and grip is impressive on all surfaces and enables the driver to get on the power earlier thanks to the active torque distribution function. The AWD models also have decent balance, too. Commodore’s specification has been ticked off in previous stories. It’s fulsome, for sure, though that first stint in the LT revealed that, if you start with the base, expect to put up with pretty ordinary seats – insofar that they are spongey and lack lower back support – and a collision avoidance system that is far more rudimentary in operation than that meted the expensive editions. 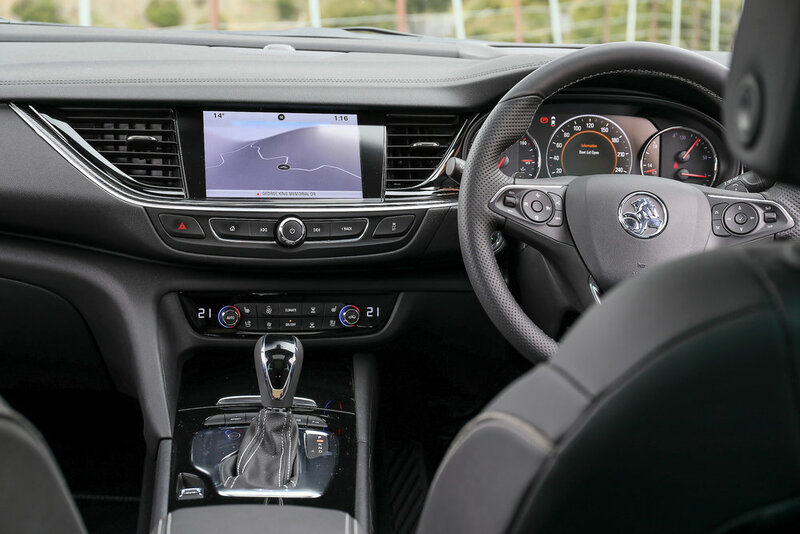 On the other hand, there’s plenty of connectivity via CarPlay and Android and the centre screen – seven inches in the base car, bigger in the rest - incorporates Holden’s MyLink system. Wireless phone charging and heated front and rear seats are reaches through most of the range. Only the more expensive variants get active LED headlights that have a higher degree of glare-reducing tech than most lamps; another feature we didn’t get to trial. All in all, if you were a rep on the run or a rental user, you could do a lot worse. No surprise, surely, that the car’s interior design is very strongly reminiscent of that in the smaller Astra hatch (also by Opel) and, thus, a bit of a step away from what Holden itself provided previously. I like the German’s attention to detail and attempts to lend premium-ness through provision of leather-clad touch-points in even the cheapies. There’s a lot for the driver to study – even a g-meter and an oil temp gauge. I’m less enamoured, though, with how they set up the computer menus; the more money you spend, the more electro-assists you get … but, unfortunately, they greater the competence, the more complex ands cumbersome the operability. Opel, take a look at iDrive. Johnson and Co. made a point of referencing that the ZB is, in fact, a little smaller than the VE and VF that immediately preceded it, and actually bigger than the old VT to VZ Commodores. Still, you cannot help but notice that it’s a bit more intimate inside; even though the narrower transmission tunnel means the footwells and hip-room are as big as ever, the front-seat occupants place a few millimetres closer together at the shoulder. Rear legroom is decent, yet headroom in the back of the liftback, due to its more rakish profile, is about 11mm shy of the VF. This makes getting in an out a bit of an awkward movement for the tall. Bootspace is typically Commodore: Huge. A split-fold rear seat makes for extra practicality. The wagon’s load-space is slightly smaller than the outgoing VF wagon, but only just. The one-touch seat-fold function in the Sportwagon is handy. Another nice touch is the automatic tailgate on all wagons bar the entry LT which requires a simple wave of the foot under the bumper to open it. It’s a bit rough, though, that a luggage net is a cost-extra even for Calais and VXR buyers. You’re keen for a verdict. But, honestly, it’s still hard to give definitive opinion; in part because – and despite all that Holden says – there isn’t quite the degree of familiarity I’d expected. They said we’d know how much of a Commodore it was from driving it… and, yet … erm. In isolation, the Tourer is the one that impressed most straight off, though even then we were left pondering how much of an Outback rival it really is. It doesn’t have as much ground clearance, the same tyres and the AWD doesn’t have any obvious dirt tuning (no X-mode here). When you drive into an area rich in gravel roads and decent off-road tracks, some of which we drove on the press launch for this shape of Outback in 2015, but have no opportunity to sample even a metre of dirt … well, what does that say? The other big hitter, that VXR, clearly a serious performance model. Yet it is clearly not cut from the same cloth as the VF SS. Anyone looking for genetic links needs try the Insignia VXR that was offered here briefly a few years back. Do that and you’ll identify massive improvement. Driving-wise, it’s a nice alternate to more expensive fare that also trades on all-paw ability. The more mainstream models will likely have the easiest time fitting in. They’re wholly better than anything Holden pitched previously in their market positions, pure and simple.